Vancouver, British Columbia--(Newsfile Corp. - November 28, 2018) - Contact Gold Corp. (TSXV: C) (the "Company" or "Contact Gold") is pleased to report that exploration drill results from an additional 13 holes drilled along the margins of the West Zone discovery, have extended the strike length of the West Zone to 2.3 km at the Pony Creek gold property ("Pony Creek"). Pony Creek is located on the Carlin Trend in Elko County, Nevada, adjacent to Gold Standard Ventures' ("GSV") Railroad-Pinion Project. The Company announced the discovery of gold at the West Zone in August 2018. Additional assays are currently pending for three drill holes from the southeast edge of the Bowl Zone. "These additional drill holes, containing oxide gold mineralization extending from surface, at Contact Gold's new West Zone discovery further demonstrate the substantial and growing footprint of near-surface gold mineralization at Pony Creek. Drill hole PC18-051 is a clear example of this, returning a 90 meter intercept with a grade thickness value of 30 gram-meters from surface and cyanide versus fire assay recovery of 92%. As we continue to better understand the structural controls to mineralization, we will apply that knowledge to focus drilling on specific structural/stratigraphic contacts to vector into the higher grade portions of this very large, newly discovered Carlin-type gold system." stated Vance Spalding, VP Exploration for Contact Gold. 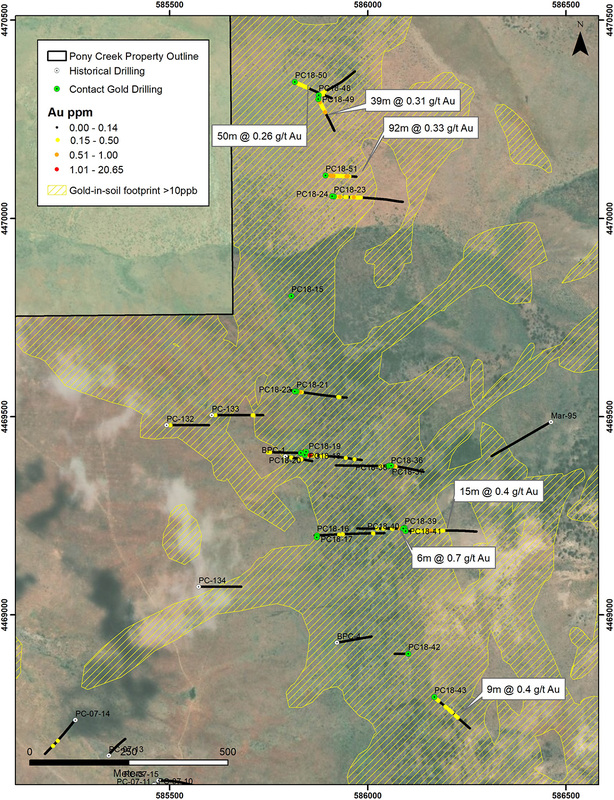 22 of 23 drill holes to date have intersected long runs of near surface and oxidized gold mineralization, with numerous individual assays ranging from 0.6 g/t Au to 1.1 g/t Au. Drill hole PC18-051 returned a 90 metre intercept beginning at surface with a grade thickness value of 30 gram-meters, and cyanide versus fire assay recovery of 92%. The West Zone currently measures 2.3 km north-south by 400 meters east-west as defined by 23 widely spaced drill tests, and remains completely open for expansion, particularly to the north and south. Average grades and metallurgy produced in this year's drill program continue to exceed cut off grades used at several economic mines in Nevada, including Kinross' Bald Mountain Mine (0.14 g/t Au). Gold mineralization at the West Zone is associated with a large, silicified, north-striking rib of Pennsylvanian-Permian aged calcareous conglomerate (the same host at GSV's North Dark Star deposit to the north of Pony Creek) and jasperoid formed in a calcareous sandstone with fossil hash limestone interbeds. Gold grades are enhanced where multiple cross cutting NW and NE striking faults intersect the North-South conglomerate ridge that lies within the north striking, Emigrant-Dark Star-Dixie-Pony Creek structural corridor. "The discovery of the West Zone is extremely exciting for Contact Gold, validates our targeting approach, and reinforces the potential of Pony Creek to host multiple, and large Carlin-type gold systems. These additional holes at the West Zone further demonstrate that Pony Creek has a growing footprint of near-surface gold mineralization." 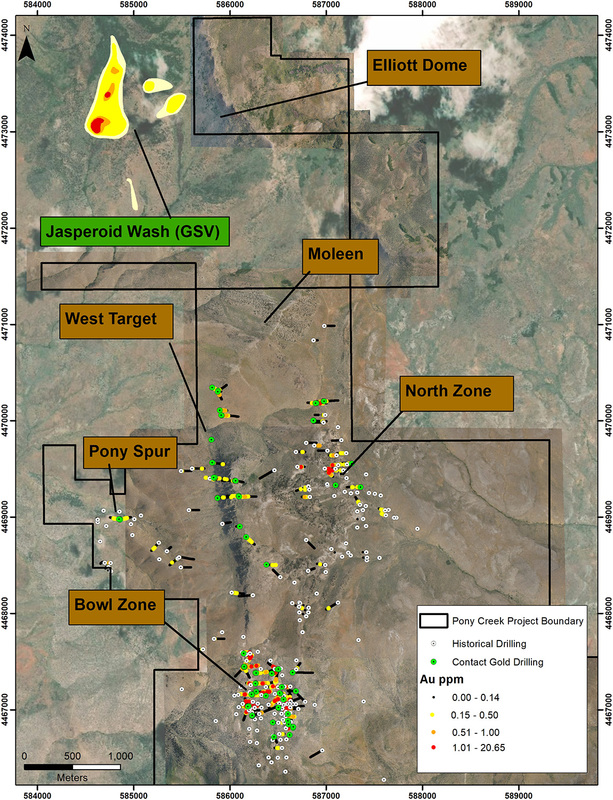 stated Matt Lennox-King, Contact Gold's President & CEO, "I look forward to testing the other high conviction, never-before-drilled targets the team has generated at Pony Creek, such as Moleen, and Elliott Dome, located between the West Zone and Gold Standard's Jasperoid Wash and Dixie targets." Pony Creek is an early stage exploration property and does not contain any mineral resource estimates as defined by National Instrument 43-101 Standards of Disclosure for Mineral Projects ("NI 43-101"). There has been insufficient exploration to define a mineral resource estimate at Pony Creek. It is uncertain if further exploration will result in targets at Pony Creek being delineated as a mineral resource. There are no assurances that the geological similarities to projects mentioned herein operated by GSV or Kinross Gold, or other project along the Carlin Trend, will result in the establishment of any resource estimates at any of the Company's property interests including Pony Creek, or that the Pony Creek can be advanced in a similar timeframe. Additional information about Pony Creek is summarized in the NI 43-101 Technical Report entitled "NI 43-101 Technical Report on the Pony Creek Project, Elko County, Nevada, USA" prepared for Contact Gold, with an effective date of October 16, 2018, and dated October 22, 2018, as prepared by Vance Spalding, C.P.G; VP Exploration of Contact Gold, and can be viewed under Contact Gold's issuer profile on SEDAR at www.sedar.com. The scientific and technical information contained in this news release has been reviewed and approved by Vance Spalding, CPG, VP Exploration, Contact Gold, who is a "qualified person" within the meaning of NI 43-101. Drill intercepts were calculated using a minimum thickness of 3.05 metres averaging 0.14 ppm gold and allowing inclusion of up to 4.57 metres of material averaging less than 0.14 ppm gold for low grade intervals and higher grade intervals were calculated using a minimum thickness of 3.05 metres averaging 1.00 ppm gold and allowing inclusion of up to 4.57 metres of assays averaging less than 1.00 ppm gold. Gravimetric assays are used for all Fire Assays above 4.00 ppm gold. True width of drilled mineralization is unknown, but owing to the apparent flat lying nature of mineralization, is estimated to generally be at least 70% of drilled thickness Quality Assurance / Quality Control consists of regular insertion of certified reference standards, blanks, and duplicates. All failures are followed up and resolved whenever possible with additional investigation whenever such an event occurs. Multi element geochemical assays are completed on composites using the MEMS 61 method. All assays are completed at ALS Chemex; an ISO 17025:2005 accredited lab. Check assays are completed at a second, reputable assay lab after the program is complete. Contact Gold is an exploration company focused on producing district scale gold discoveries in Nevada. Contact Gold's extensive land holdings are on the prolific Carlin, Independence and Northern Nevada Rift gold trends which host numerous gold deposits and mines. Contact Gold's land position comprises approximately 212 km2 of target rich mineral tenure hosting numerous known gold occurrences, ranging from early- to advanced-exploration and resource definition stage. Additional information about the Company is available at www.contactgold.com. This news release contains "forward-looking information" and "forward-looking statements" (collectively, "forward-looking statements") within the meaning of the applicable Canadian securities legislation. All statements, other than statements of historical fact, are forward-looking statements and are based on expectations, estimates and projections as at the date of this news release. Any statement that involves discussions with respect to predictions, expectations, beliefs, plans, projections, objectives, assumptions, future events or performance (often but not always using phrases such as "expects", or "does not expect", "is expected", "anticipates" or "does not anticipate", "plans", "budget", "scheduled", "forecasts", "estimates", "believes" or "intends" or variations of such words and phrases or stating that certain actions, events or results "may" or "could", "would", "might" or "will" be taken to occur or be achieved) are not statements of historical fact and may be forward-looking statements. In this news release, forward-looking statements relate, among other things, to the anticipated exploration activities of the Company on the Pony Creek property.